I'm still waiting on stuff from another company, but WPG's merchandise come like greased lightning. I'm not sure if the leather strap could be longer to get around the sole of my brogans more easily. Otherwise, I love them! Jerry, you need to make larger sizes!!! My sons are 6’5 and 6’2. 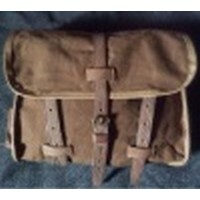 Bought these for my 1910 era cavalry outfit, as I am a volunteer bugler for Military graveside services...very satisfied and they look and wear great..
All items are top notch and fit nicely, no problems. Bob Bardsley! Good color and shape as like original, and I live in South Korea, received same week after order. Hi, I received the leggings and they're very well made. I just spent a while trying to get the on. I looked up "how to lace leggings" on Youtube. The Spanish American War leggings don't lace up the same way as WW1 or WW2 leggings. It's best to look at WPG's picture. Very well made, authentic reproduction. Pleased with my purchase. Well made item, fit as advertised. Been looking for these for awhile now and this was a real find for me. This is the second pair of canvas leggings I bought, this time to use as a gift for a friend. I bought my pair for hiking purposes, as I do not like the modern snake leggings.They are very comfortable,stylish and surprisingly practical! High quality, and they appear to be faithful reproductions. I said this about another item, but getting and keeping things in stock and in a range of sizes would help. These are so well made you would swear they are made by the original military contractor! Great reproductions of these impossible to find turn of the century leggings! Doing a Rough Rider or cavalry impression? You can actually ride in these. They are tough, comfortable and look even better after a couple of weeks "in the saddle." I was glad to see this item at WPG. These are an impossible to find accessory for the Span-Am period. I was sorry to hear that they are already out of production. The only criticism I have is the rivets are not quite the quality that I would prefer, hence the 4 instead of 5. None-the-less, I am glad I got these before all the inventory is gone. Another fantastic, high quality reproduction. They fit as they should, and are of a relatively heavy weight canvas, so they will hold up to abuse.